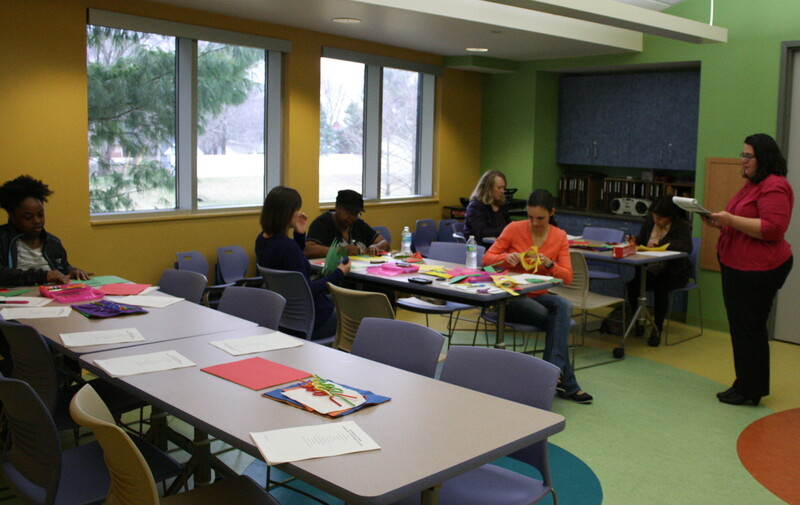 Jodie Rodriguez addresses the attendees while they work on busy bags for their children. O’FALLON – O’Fallon Public Library patrons that are curious about how to get their younger children ready to read have the opportunity to learn how in a four part class series. 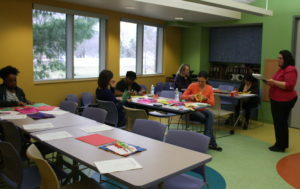 Facilitated by Swansea resident and library patron, Jodie Rodriguez, the classes are a mixture of tips, crafts, and resources. Rodriguez, a former elementary school teacher, former principal, blogger and mother of two boys under age five, is passionate about reading. “I saw a quote that less than 50 percent of children are read to in the United States, and that statistic just shocked me. It’s one of the best things that you can do for your children. If you read to your kids for 15 minutes each day for five years, that’s 27,375 minutes, or over 456 hours of reading,” shared Rodriguez. She went on to explain that all of that time prepares children for reading themselves, exposes them to lots of different language, styles and ideas, and inspires them. 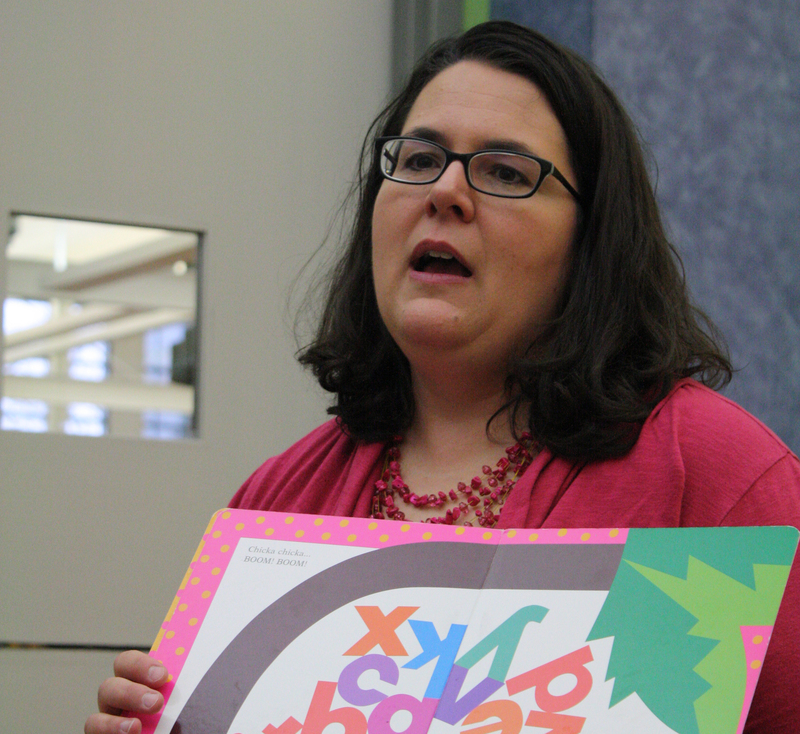 Rodriguez’s blog, Growing Book By Book, was something that she started after she left her career in education. When one of her sons was born premature, she made the decision to be a stay at home parent. Starting the blog to share her passion for reading and education with others became an outlet to reach other parents. The blog has been booming, reaching more than a half a million people in the last year alone. The library classes are live tutorials and take heavily from various aspects of her blog, and each class has a different focus. February’s class focused on talking with versus talking to your child, March’s class focused on reading itself, the next class, scheduled for April 16 at 10:30 a.m. will focus on singing and playing with your child, and the final class, scheduled for May 14 at 10:30 a.m. will focus on prewriting skills. Patrons learned different places to obtain books, such as the library, were educated about different types of books to read with their children, were given the idea of Family Dinner Book Club, including recipes and a sample place mat activity, and participated in making crafts. Rodriguez gave each attendee bags of blocks that their children could play with, and then crafts like name shapes were made for the attendees’ own busy bags. Rodriguez’s passion came across when she showcased a table full of books that were available from the library, and she showed the class how to read the books, different types of books, and where to find book lists for different ideas of what to read. To join the next class, inquire about registering at the O’Fallon Public Library, or register online at www.ofpl.info by finding the event on the calendar and clicking the “Register” tab. For more information from Jodie Rodriguez, and to view some of her tools and ideas, visit www.growingbookbybook.com, or search for Growing Book by Book on Facebook and Pinterest. Hello! For what age group of children is Jodie Rodriguez class about reading to children?